If a large chunk of your life has never been consumed with the responsibility of keeping a toddler occupied, then the simple elegance of this children’s book might be lost on you. If it has though, then you’ll likely recognize immediately the cleverness and simple elegance of Mike Vago’s Train. Marketed to kids aged 4 to 8, this is a book and a toy. It’s a plastic train (and you may or may not know how much kids obsess over trains at that age) that cannot be lost. It is a block book that will fascinate preschoolers as well as their intoxicant-enjoying parents. The titular train awaits the reader in the station when the book is opened. It can than be pushed along a track, across the page, through a tunnel onto the next page, and so on throughout the length of the book. All without ever leaving the track. Vago—whose name you might recognize from the byline of many A.V. Club articles—was tinkering with the concept for close to a decade before its ultimate publication earlier this week. 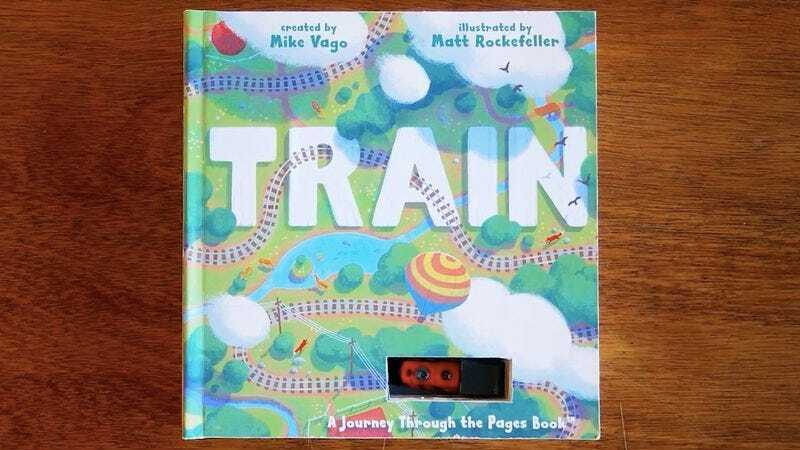 Train—co-created with writer Lorraine Freeney and illustrator Matt Rockefeller—is available through Workman Publishing.